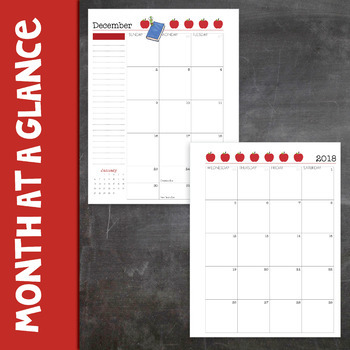 Try out my classic teacher planner with this free sample: a calendar for December 2018. If you’re not sure whether a printable planner is right for you, this is your chance to see how easy it is to use. 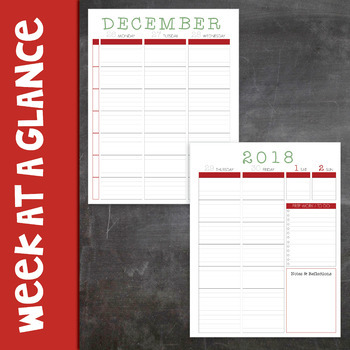 Personalize the editable calendar labels, print the monthly and weekly planner pages (double-sided), and plan your seasonal holiday activities! 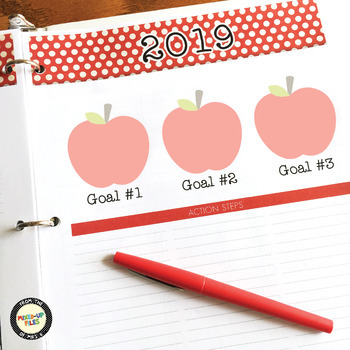 This free download is an excerpt of the Old School Teacher Planner 24-month set for 2019-2020. ✓ Personalize your planner by adding your own labels to time slots on the weekly calendar pages; enter text once and it will automatically copy onto every weekly calendar. ✓ Print on good quality white printer paper. Pages are formatted for double-sided printing and are ready for binding with a holepunch, spiral binding machine, or professional printing and binding. 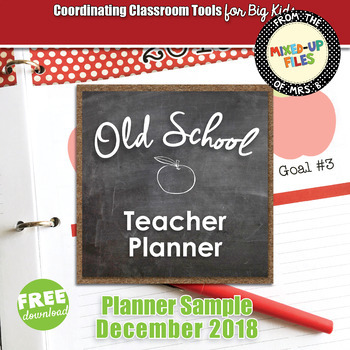 This set of Teacher Planner pages coordinates with my Old School Style Classroom Decor Bundle.